Last week my English teacher pointed out that "quote" is a verb, and the noun form of the verb should be "quotation". So this post series of mine, should actually be named "Quotation of the Day" (I don't like it either). Isn't that ridiculous? We've all gotten so used to saying "Quote of the Day" that we don't even realize that it's grammatically wrong (can you imagine the number of other things we're doing wrong and don't notice because we do them all the time?). At one time, Carl Sandburg was one of the most talked about men in America. I can imagine that he comes from a time when the American dream of a rags-to-riches story was still alive and burning, a time when the country was still idealistic. I'm not a (complete) nostalgic, but maybe the world was a better place in the 1960s...I mean what's happened to the American Dream today? Where's the idealistic optimism for change? I don't know what it is with the world and the blatant dislike for the dreamers, the idealists, and the wanderers. What would it be to live in a society without them? Those who stray from the linear path, the highway, of the "purposeful" are the ones who find better paths to follow. Everyone knows that the scenic side-roads make for a better journey than the traffic-y, fast-paced highways. Those who can dream up a big, beautiful world for themselves are the only ones who can even come close to creating one.When we dream, we create, Dreaming is for aspiration, but sometimes it also for escaping reality. A person who doesn't dream, who cannot fantasize, must certainly be the happiest person in the world, or the saddest. Have you ever noticed how no piece of art, or any other creation, lives up to the image first envisioned by the artist? Our brains are just better builders than our hands. How can we ever create a perfect world if we cannot even envision one? How can we ever reform the flawed system if we keep accepting it as it is, and playing by its rules? 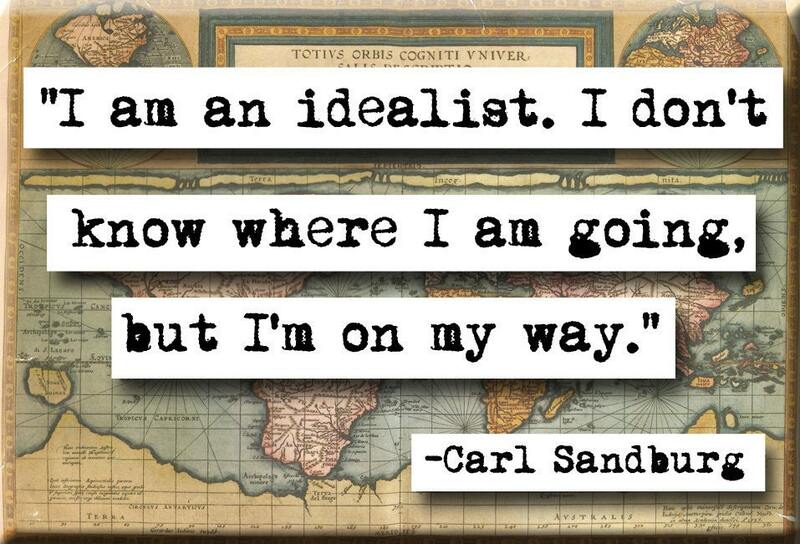 To be an idealist is to be able to see the world as a better place. Yes, idealism is unrealistic. But that's the point. Idealist are not realists; they do not accept the words "it is what it is". They acknowledge the problems of this world, and want to create a world where these problems don't exist. Believing in the best of the world is not naive but revolutionary.